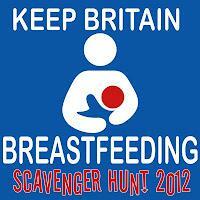 Welcome to the second week of Keep Britain Breastfeeding! Breastfeeding in public does not come very easy for all of us.Especially when you are a new mum,it can be very stressful. Last year, I wrote about some tips that should be helpful. It is one of my most popular posts so I thought I would share it once again for new readers/followers. You gave birth to a little baby and a few weeks later decided to go out. Okay, let's face it. It is a little bit daunting to think about breastfeeding in public. For the first few times, try to get out with with your other half , mom or a close friend. Being with company and keeping the conversation does help. Nurse your baby just before leaving the house so it will keep him for a while. Plan your journey. If you need to breastfeed, choose family-friendly places. You can always pop into high street stores and use their feeding rooms,too. If you don't feel confident enough yet,in a cafe, sit facing the wall. Find a corner that is likely to be ignored. I have never used breastfeeding covers/blankets with my babies. I feel like it just draws more attention to the fact that I'm breastfeeding. If however, it makes you feel better, go for them. There are some fabulous prizes up for grabs so don't forget to enter the Scavenger Hunt Competition trough the Rafflecopter System. To enter,please leave a comment on this post. Please check out some of the bloggers and sponsors supporting the Breastfeeding Scavenger Hunt 2012. For a full list click here.